Welcome to Little Jewel Baby Nursery, the adoption site for lifelike realistic reborn vinyl collectible baby dolls or fake babies. I use realistic soft skin vinyl baby dolls/kits produced by companies like Berenguer, Ashton Drake, and other new popular doll artists. 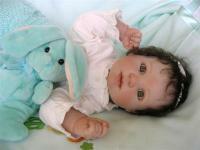 The reborn/newborn process creates a true to life highly collectible heirloom baby. Turn to Little Jewel Baby Nursery for an amazing lifelike baby doll!